" Depending on depth of operation relative to weed roots. 6 Especially good at severing shoots from roots, but poor at fragmenting plants. the soil surface: the shallowly angled sweeps of a sweep plow tend to sever roots and loosen the soil above with little mixing relative to the more steeply angled and closer spaced blades of most field cultivators. Finally, disks and rotary tillers chop up weeds and crop residue, and mix them into the soil profile to the depth of penetration. 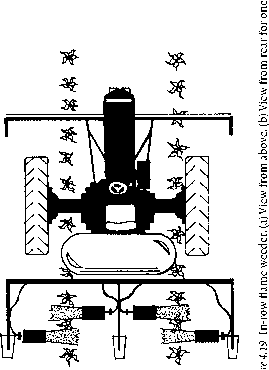 Disks tend to cut the weeds whereas rotary tillers tear, but the effect on the plants is often similar. Because both mold-board and chisel plows leave large clods and intact weeds, operations with these implements are generally followed by use of disks, harrows, or some other implement to further chop and mix the surface soil prior to planting. 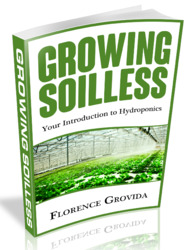 Consequently, tillage usually subjects weeds to a variety of destructive actions. Depending on the implement, tillage thus chops, uproots, or buries established weeds. Usually tillage occurs early enough in the life cycle of annual plants to be fatal to essentially all individuals, regardless of the method employed, though young grasses sometimes survive noninversion tillage (Moss, 1985a; Cavers & Kane, 1990). Although many studies have noted an increase in perennial weed species with reduced tillage (Jones, 1966; Pollard & Cussans, 1976; Froud-Williams, Drennan & Chancellor, 1983; Koskinen & McWhorter, 1986; Conn, 1987; Buhler et al., 1994), surprisingly little research has related the mechanical action of implements to damage inflicted on the weeds. For example, it would be useful to know how different implements affect the size distribution of Elytrigia repens rhizome fragments, the vertical depth distribution of Cyperus spp. tubers, or the percentage of damaged buds on Taraxacum officinale taproots. Wanderingperennials rhizomes, etc., below tillage depth rhizomes, etc., above tillage depth with bulb, tuber etc. further subdivided according to the scheme of Hakansson (1982). The effect of tillage on a wandering perennial depends on whether the implement reaches the storage roots or rhizomes, or merely severs the vertical branches. Similarly, the presence or absence of a taproot, bulb, or similar storage organ influences the response of nonwandering species to tillage. Annuals with a phenology that is out of phase with the tillage operation behave as perennials. For example, an autumn-germinating annual presents well-established, overwintering plants to a spring tillage operation and thus responds as would a perennial. Perennials like Asclepias syriaca and Convolvulus arvensis in which a large proportion of the perennating roots or rhizomes lie below the plow layer are susceptible to tillage primarily through exhaustion of reserves. Because the rhizome lies deep in the soil, a long, usually large-diameter vertical shoot is required to get the growing point to the soil surface. Consequently, replacement of shoots that are removed by tillage requires a substantial investment of energy. However, because the dormant buds on the deep rhizomes are immune to all except extraordinarily deep tillage, substantial control of a population by tillage alone may require fallowing the field in order to perform several operations (see below). Although weeds with shallow perennating roots and rhizomes can be uprooted and chopped by tillage implements, this often has only a short-term benefit since rhizome fragments develop new shoots and new roots grow to supply exposed pieces of shoot. Moreover, separation of buds onto a multitude of small root or rhizome fragments can actually increase the productivity of some weeds by releasing buds from apical dominance (Hakansson, 1968b; Hakansson & Wallgren, 1972a, 1976; Bourdot, Field & White, 1982). In addition, if the implement drags fragments around the field, tillage may effectively disperse the weed, as well as propagate it. Nevertheless, as detailed below, shallowly wandering perennials are susceptible to a variety of mechanical measures. Some perennials spread by rhizomes but perennate by means of a bulb or tuber. These species may pose particular problems, because the tubers tend to survive tillage intact and the substantial food storage allows emergence after deep burial. Cyperus rotundus, which has been labeled the world's worst weed species (Holm et al., 1977), is of this type. However, this and similar species may be attacked by tillage that destroys the shoot shortly after emergence, or that exposes the tubers to desiccation (see subsequent sections). The effect of tillage on nonwandering perennial weeds depends on whether the species has a taproot or equivalent storage organ. Uprooting species with a taproot is relatively ineffective (Table 4.2) unless the root can be brought to the surface to desiccate during dry weather. Simply removing the leaves is ineffective because they quickly regrow from the well-supplied root crown. Burial may be an effective control strategy if the storage organ is severely fragmented. Most nonwandering species without taproots (e.g., Plantago major) are easily controlled by tillage (Table 4.2). In this regard, Poa annua, which commonly perennates (Law, Bradshaw & Putwain, 1977), is an exception that proves the rule. This species is notoriously hard to kill with shallow tillage methods because soil clings to the dense root mat (Bates, 1948). However, when clumps are successfully broken up, the fragments often die quickly. Since most nonwandering weeds without taproots have a rosette growth form with small storage reserves and limited capacity for stem elongation, burial is often highly effective. Consequently, these species are rarely problem weeds in tilled systems. Various strategies exist for mechanical management of perennial weeds. Which approach is most effective against a particular species depends on the growth and stress response characteristics of the weed. Effectiveness of all these strategies is improved by understanding the growth cycle of the weed.